- I always think it's cheeky when entities pop up on manufacturers forums for a leg up; I do hope you will give me a pass, as I have contributed to the great Reaper Edifice (in a minuscule way) with a few sculpts in the past (Reaper Ron was kind enough to relieve me of a few Dregs.. Ghoul/Zombie sorts). I'm just tinkering with a little range of my own , perhaps more whimsical fantasy figures..
Got a batch of greens finished (two gang/factions.. enough for an initial mould).. and am immersing myself in a bit of hitherto unexplored social media (only got on FBook this year!). Your pieces are WONDERFULLY imaginative & DELIGHTFULLY silly/whimsical. VERY WELL DONE! Admittedly, I did get a frosty non-welcome at the old FrothersUKForum (but felt I had to post there, to honor The CyberGods of Old). 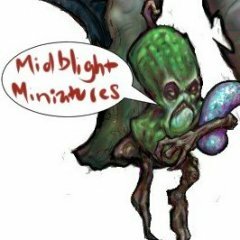 If you've a blog/ instagram/FB with your modelling work, let me know, and I'll take a peek (always interested to see what my fellow mini-fanciers are up to). HUUUUUGEE fan of your work, and amazingly enough, I was literally painting some base glazes on your Fractured Dimension Kostchtchie just last night!!! I've got your Dregs in metal from Reaper and several others of your work from FD. I've been waiting to do an appropriate diorama for your 'paladin in hell' for some time. Just went and liked your FB page and will definitely look out for your stuff online if/when it starts selling, or if you venture to Kickstarter or something like that. It was my pleasure to supply a morale boost. For me posting photos of my work is about the only way they will be seen...I do send dome out as surprise packages as another way of having them seen. Cute little goblin. Nice detail work, too. I can just imagine her offering a poison toadstool or a magic apple to some young adventurer. Very characterful sculpts. Is that a dogs head I see above one of the goblins? Adrift - thanks! 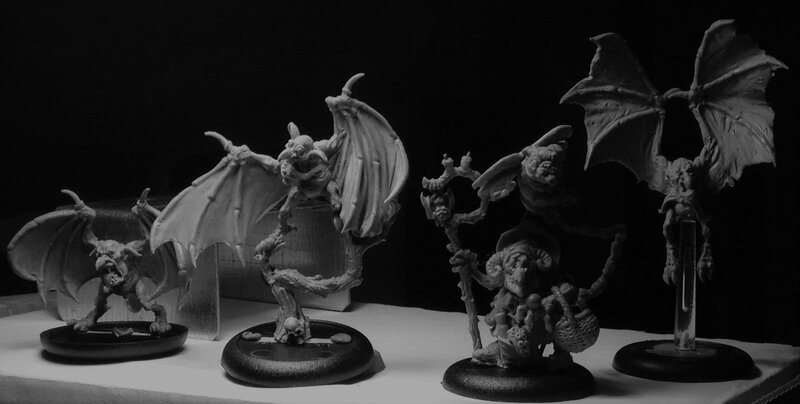 The Fractured Dimensions project was pretty expansive; I think the wee Perribo clowns were my favourite sculpts.. there're some nicely painted examples if you search out : Minis by Finch (blog). Malefactus; Wow- really impressive/inventive passion project (sort of thing I'm aiming for in ways, though you're light years ahead), your scenes/characters are reminiscent of stop-go animations (cool stuff). Darsc -Ta, The Moonpug appeared outta nowhere (they are cute little things). Oh... oh that's great! I have a friend who's going to love that! I keep seeing that string of sausages as an umbilical cord. Crowley- Thanks! I sculpted that one middle of 2017 (since then, quite a few 'doggy adventurers' have popped up). Added a couple of dwarv-ish pics..
Not my kettle of tea, but yeah, they look fun. Gadgetman! - Well, thanks for pausing to give them a once over (in any case). - I long resisted Facebook's Dark Palantir... (in fairness, it's generated a bit of work for me since I .. 'plugged in' , in April). typed 'them' twice by accident, then recoiled.. The plan for these is to make Ice goblins. Going for a blue skin tone and frosted bases. All of the Armored goblins save for one require assembly. I was pleasantly surprise how easy they came off the sprues. Didnt need cutters. Though you will need to scrape a bit off the tab points but all in all they go together very easily. This bad boy is one piece. I decided to hop back on the RPChallenge wagon! These guys have been languishing on my desk, just in need of some touch-ups and basing. So I knocked those out, and I'm calling them done. They'll be fun to use as a marker or something. I did a WIP on my blog, feel free to go check it out! I update there much more frequently than I post here. Hope y'all enjoy them! C&c is always welcome!